You are here: Home / Religious Query – Does “No Pork, No Lard” means the food is Halal? 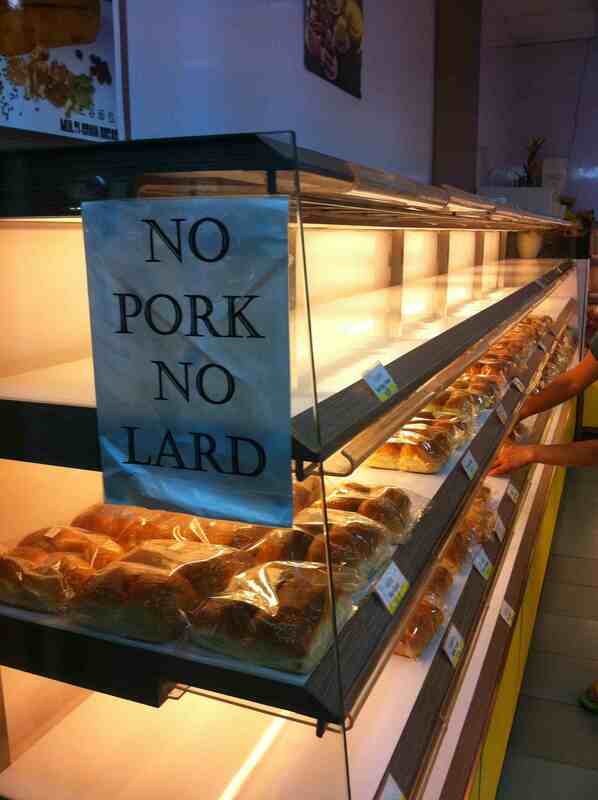 Religious Query – Does “No Pork, No Lard” means the food is Halal? This is the translated version of the original Malay article published in Berita Harian (Singapore) on 27 October 2013. To access the original Malay version, please click here. I would like to thank bro. Muhammad Azril bin Muhammad Yusof for his help in translating the article. May Allah reward him with His best reward. Can Muslims patronize shops or food suppliers that have no halal certificates but instead display labels showing “No Pork , No Lard “? Consuming halal food is obligatory on all Muslims (The Quran, 2:168 and 172) . However, Islamic scholars differ in their opinions about what constitutes halal (permissible) and haram (non-permissible). For example, some scholars view that there is no restriction when it comes to eating amphibious animals, while some scholars only permits fish as the only permissible seafood that can be eaten, different from the view held by the Syafiite – the dominant school of jurisprudence among Malays and in this region. Thus, there exist varying opinions and flexibility when considering whether a food is halal in Islam, even though the principle is the same. But in the context of Singapore and due to limited space allowed for this article, let’s address this issue to only the Syafiite school (practiced) here. Therefore, any food that contains contents of prohibited substances mentioned above is considered non-halal, or in other words, is haram to be consumed. A simple way for the public to ensure that a food is halal is by looking at the logo or halal certificates issued by MUIS or other reputable overseas Islamic institutions. You can ask for help from MUIS halal department with regard to this should there be any doubt about a certificate or the halal logo from other Islamic institutions abroad. It should be made clear that any food that does not meet the above criteria are not permissible to be consumed altogether although the providers, vendors, store operators and chefs are Muslims. Instead, a food is halal if it meets all the criteria as stated above even though the providers, vendors, store operators and chefs are non-Muslims. For foods that do not have logos or halal certifications, there are two options that can be considered. Firstly, we can assume a food to be halal after a reasonable assessment has been made by reading the list of its contents or observing the site where the food is handled and there seems to be nothing or any evidence that makes the food forbidden to be eaten. Especially if there are many other options that are clearly permissible and not suspicious in nature. This is the safest choice, though it is not a must in all circumstances. Although there are shops with notice board displaying the word “No PORK, No LARD”, here are some notes that needs to be known. “No Pork, No Lard” is not an absolute assurance that the food is halal as the criteria for a food to be halal are as mentioned above, and not only dependent on the absence of pig elements in it. The food may not be permissible as the animal may not have been slaughtered according to Islamic requirements. It may also contain ingredients from alcohol or impurities. It would be more accurate to point out that food with the status “No Pork , No Lard” is the same as foods with no logos or halal certificates as mentioned above, and the same principle needs to be applied to decide whether the food can be eaten or not . Should be reminded that God created man, full of diversity, both in terms of knowledge, personality and others. This leads to differences, among other things, in the level of conservatism. Some have high conservatism and some are low that shape choices in life, including food choices. Because of the diversity in human behaviors, we find there are some who are only comfortable eating at places that display halal certificates or, are operated by Muslims only, while some are more open and flexible . Some are inclined to stick to the principles of being cautious and play safe, while there are others who follow the maxim, “Everything (related to non-ritual) is permissible until proven otherwise”. There are those who want to examine in detail before deciding if something is halal and there are some who accepts whatever is visible to their eyes. When factoring the differences in opinions among other schools of thoughts with regards to food, more and more young people are exposed to views from other schools of Islamic jurisprudence with regards to this matter and the increasing number of Muslims from other countries that follows differing schools of Islamic jurisprudence in, surely the consideration of a food being deemed as halal has become increasingly varied. In this case, managing different viewpoints of what constitutes halal food has become important to avoid misunderstandings that could create negative reactions, which is not favored by religion. Do not be quick to judge something as haram or accuse those who choose food that has no certificate, or not displaying halal logo, or a “No Pork, No Lard” signage as beng in the wrong, unless we clearly know and have proof that the food is haram. It is important to understand that it is the responsibility of the accuser to provide proof when they declare that the food is haram because the original rule on the matter is it is halal until proven otherwise. Being prudence (wara’) is encouraged, but it cannot be forced on to others. Ask questions and get clarification before reprimanding or judging because that person may have information that we do not know or he may have a different viewpoint on the matter. If we cannot or could not be bothered to ask questions and seek clarifications, and have no solid evidence that the food is haram, we should respect a person’s food choice and be respectful about it as commanded in The Quran, 49:12. We can offer a better choice, one that is safer or share our views of our food choices, but in a wise manner, not by being judgmental or harsh, and we should leave it to the one concerned to either accept it or not. Do not equate people who eat foods that are not clearly stated as halal to be the same as eating food that is clearly haram such as pork or alcohol because both these types are not equal, in fact and Islamic ruling. Muhammad Haniff Hassan is a Research Fellow at the School of International Studies S. Rajaratnam (NTU, Singapore ). He graduated in sharia and law (UKM, Malaysia) and international studies (NTU).